As I’ve previously mentioned, Loving Garland Green members are growing a patch of teosinte, the ancestor of modern-day corn at the Garland Community Garden. We can tell you with a great amount of certainty now that teosinte grows well in Garland. We can also tell you with some authority that one must be very patient to grow teosinte. According to authorities it takes 120 days from planting to maturity. In regard to the teosinte at the Garland Community Garden, it has already been about 130 days and the ears are still not mature, but it does look like they will get there. You can see teosinte down at the Garland Community Garden at least for the next few weeks. However, prior to that time we will also harvest the tiny “ears”. Each stalk of teosinte produces 5 to 15 ears of corn, which sounds like a lot until you consider that each ear only has about 12 kernels. When you compare 12 kernels to the 800 found on a typical ear of modern-day corn, you’ll see what I mean. No one knows precisely when the first corn tortillas were made from primitive corn called teosinte that was ground on stone metates, but most agree that it was no doubt many thousands of years ago. It was not until the Spanish arrived in the New World, bringing wheat with them that the flour tortilla was born. Genus Zea, a group of plants in the grass family, encompasses all modern domestic corn varieties including Teosinte. Only five genes separate modern corn from its ancestral precursor, and both plants have the same number of chromosomes. The two can even produce fertile hybrids! 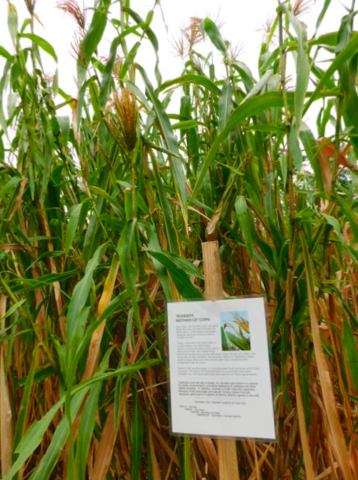 Teosinte was foraged by Mesoamericans more than 10,000 years ago. The ancient people probably began collecting and saving kernels from the tastiest plants ensuring that there would be more for the next season. By doing this, they limited the gene pool and compounded the most favorable traits. People probably began to notice the results of these deliberate choices after several generations of corn and began to refine them. This process became known as selective breeding. Thousands of years later in the mid-1800’s Gregor Mendel, a friar in St. Thomas’ Abbey, refined such techniques to create hybrids. If we have enough teosinte seed, we may grind some of it into flour and give away at our 2017 Harvest Festival. If so, here is a recipe from the Moosewood Cookbook that we will likely recommend. A caveat in the recipe’s narrative is to use masa harina, which is a corn meal ground in a certain way and is treated with lime water. According to them the flavor cannot be duplicated but you can purchase masa harina at most grocery stores. Mix masa harina and water together (and salt, if you choose), first with a fork, and eventually with your hands. Knead for about 5 minutes. You may have to add a little extra water. The dough should hold together. Make 12 equal balls, smooth and round. Roll out each ball, on one side only, on an unfloured surface (Formica works well) or between two sheets of waxed paper, to 1/8-inch thick. Trim the edges of the circle with a knife. You should emerge with a neat, clean, thin 6-inch round. Pan-fry on a lightly greased griddle or heavy skillet over medium heat, 3–4 minutes on each side. Wrap in a damp towel, and keep them warm in a 200º F oven until serving time. Makerspaces are not what a lot of folks mistakenly think they are. Most folks really don’t understand MakerSpaces as the unique educational tool that they are. Some smugly dismiss them as places that simply indulge hobbyists while others think of MakerSpaces as being synonymous with large industrial manufacturing facilities that churn out noise and pollution. Both viewpoints are misconceptions. Among other things, Makerspace are not large mass production sites of any product. 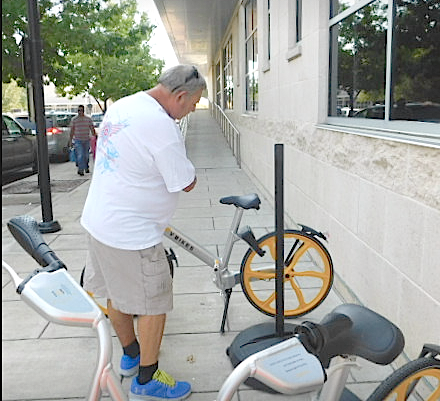 In terms of noise, drive by the Dallas Makerspace and let me know what you hear. Makerspaces are the new model, in fact, the future for effective learning environments. They have more in common with community centers than industrial factories. These places are human-centered designs that facilitate and encourage collaborative learning and shared knowledge. These are places that put expensive tools in the hands of creators and thinkers who would not otherwise have access to these tools. But perhaps even more important than the tools, Makerspaces put people with similar interests in touch with each other and provide an environment conducive to sharing ideas and thus spawning creations that otherwise would never have sprung forth. Ever since the Luddites, people have been talking about technology wiping out jobs and it’s true, looking back through the lens of a historical perspective, indeed technology has wiped out jobs. Now today we have the specter of robotics on the scene bringing with it the fear of more jobs lost. With the Support of City Leadership, a Different Future can be embraced and shepherded forward. The estimated worldwide count of Makerspaces today is 2,000. Most of these are located in cities with progressive leadership that supports new ways of moving into the 21st century and, while they have similar qualities each makerspace is a little different. For example, I am currently working on a team that is exploring the possibility of bringing a Makerspace to Garland. We all come from different walks of life and most of us did not know anyone in the group prior to its formation. We responded to an ad in a local paper inviting any resident of Garland interested in a Makerspace to meet. I have wanted a Makerspace in Garland ever since July of 2015 when I learned about them and visited the Dallas Makerspace. I’ve been writing to my city leaders about it since then as well writing posts on the topic in this blog. My enthusiasm for Makerspaces is not new nor has it dampened over the past two years. In the planning of what our makerspace might look like we each bring our own unique experiences to the table, as I’m sure is true in regard to the formation of makerspaces all over the world. For my own contribution, as you might surmise, one of my intentions is to make our Garland makerspace the greenest makerspace in the world—one that follows principles of permaculture and ISO. I believe that cities must lead in the green example and as part of that green leadership cities should encourage residents to grow at least some of the food they eat. Cities are critical places that will continue to grow in power. We are beginning to see the rise of the city-state. For example in the USA cities like New York City and Los Angeles have practically become countries unto themselves. According to a United Nations Report: Today, 54 per cent of the world’s population lives in urban areas, a proportion that is expected to increase to 66 per cent by 2050. Projections show that urbanization combined with the overall growth of the world’s population could add another 2.5 billion people to urban populations by 2050. [Source: http://www.un.org/en/development/desa/news/population/world-urbanization-prospects-2014.html - Accessed 9/28/2017] Thus the direction of city leadership today is critical to the future of our nation if not the survival of humanity. The following is an excerpt from a post I wrote in 2015 after visiting the Dallas Makerspace. 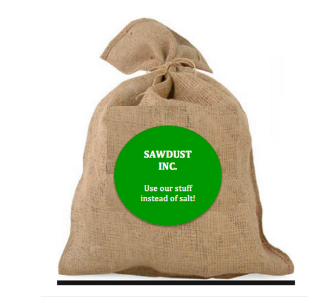 This is one example of the green thinking I would bring to the Garland makerspace. It is also an example of just how stimulating the creative environment of a makerspace can be. We need one in Garland and not in a couple of years, but within a couple of months. Makerspaces support and grow local economies. How are many Cities supporting the Maker Movement now? I had a comment about my last post regarding the Tango Bakery saying that it was promotional and asking if I got paid for writing it. The answer is No. I did not get paid for writing that post nor do I nor have I ever received a penny for anything I write on If Liz Were Queen. In regard to Tango Bakery, to date I have neither met nor talked with the owners--ever. Why did I Promote Tango Bakery? Because I found the ambiance of their establishment classy and exceptional! Because I found their desserts exceptional!--Truly the best cake I ever ate. Because I found the people who waited on me and answered my questions to be nice, cheerful and professional. Because they have a very unique business model. Because this is a one-of-a-kind local Garland business. All of us should shout it from the mountaintop when we find a locally owned business that we like. Tell our friends. Tell our family. Tell our co-workers. Tell everyone. Often the survival of a local business depends on local people doing just that--telling others why you like it. Where we live (local) is important to us. Local business are great for our local economy. Statistics vary from study to study, but they all agree that more of the dollar spent in a local business stays in that local community. To learn more about why you should promote local businesses, here is a great link from the Institute for Local Self-Reliance with additional links to many studies regarding why local matters. Where else? In Garland, Texas, of course! I know already some might be thinking: “Garland” and “Gourmet” in the same sentence? Isn’t that an oxymoron? I thought that gourmet for Garland residents meant eating out at Babes. It’s high time folks started realizing that we like to mix it up in Garland—not unlike the way they mix things up in Austin, Texas and other cool places. Yes we appreciate down-home cooking and we also walk on the fancy side with one-of-a-kind local places like Tango Bakery Designer Cakes/Latino Ballroom tucked away in surprising locations throughout our City. I was going to wait until tomorrow so this post didn't overlap so much with the previous one, but to tell the truth, I couldn't wait to tell you about Tango Bakery and the Latino Ballroom! Most wouldn’t expect a high-end place for food to be snuggled up in a long strip of used car businesses, but that is exactly where you will find Tango Bakery and Latino Ballroom. Also the combo of a bakery and a ballroom is likely to produce a few down home "du-whuts?" --yet the ballroom and the bakery make perfect combo sense once you learn that the talented bakers who own Tango Bakery also cater wonderful dishes for private events--and what better place to hold the event than in their elegant ballroom, complete with chandeliers and fantastic linens. Charlie and I have been driving past Tango Bakery for about two years on our way to Rohdes (my favorite local organic nursery in Garland) and sometimes to the Hollywood theater a little further down the road where they have the cheapest movies in town. Just about every time we drive by the Tango Bakery and Latino Ballroom we make comments to each other about what it might look like inside this place nestled in between used car dealerships that line this section of Garland Road. In fact, it turns out that Tango Bakery Designed Cakes/Latino Ballroom is indeed a repurposed used car dealership. But if you think you will be visiting some tacky dirty cramped interior that serves up fried churros, you are in for a pleasant surprise from the moment you step inside this local business. The décor could be described as “high end industrial loft” style with unexpected touches of whimsy. The interior is as sophisticated as you might find in the funky Soho glam district in NYC. It is so well done that at first I was a little disappointed because I thought that surely it must be some high-end franchise but no, it is truly, at least for the moment, a one-of-a-kind Garland local business. Thus, if you don’t live in Garland and you want to see the Tango Bakery, you are going to have to visit Garland, Texas because like many things in our local-centric city, the Tango Bakery/Latino Ballroom is a one-of-a-kind place found only in our City. 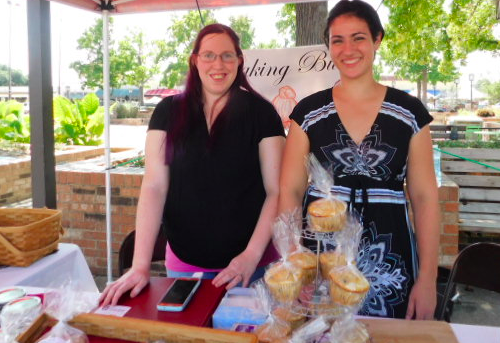 Although the Tango Bakery has been in business since 2008, they have been at their present location for two years. After 25 years of experience in the field, Adrian Ross and Sergio Mendoza opened the doors to this high-end pastry bakery shop with an essence based on the creation of unique design cakes for all kinds of occasions. 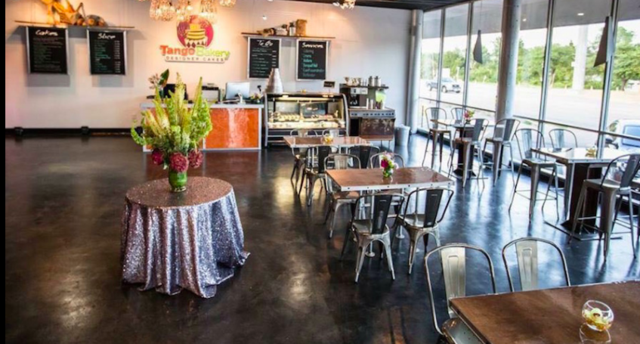 There are many ways to tango with this great local Garland Business: 1) Visit the Tango Bakery and have one of their delicious desserts 2) Buy a dessert to take to the friend you left at home. 3) Reserve the beautiful Latino Ballroom for your next big event 4) Talk to Adrian about assistance in planning your event. He can help you with everything--from choosing the theme to choosing the napkins. If you are planning a holiday event, don't enlist the same old hotel ballroom and settle for rubber chicken. Instead visit with Adrian and Sergio to see if you might do better--not only with the menu and venue but also the price. Do it soon and make reservations if indeed you still can. Last night when Charlie and I stopped by, there was an event in progress in the large ballroom so we didn’t get to peek in. But I’m sure judging from the interior of their bakery space that it is imaginative and spectacular. 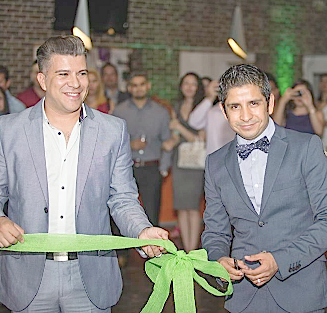 You will need to call Adrian and Sergio for details regarding reservations for the Latino Ballroom and all the great services they offer: catering gourmet dinners; snacks; desserts. Fine linens, dishes and silverware—decorating the ballroom according to the theme of your event and more. Their bakery is a lovely place to sit down and have a wonderful dessert that will melt in your mouth. I'm not kidding the cake I ate was the best cake I ever ate in my life and that includes my own homemade German chocolate cake AND the wonderful tiramisu cake made at Whole Foods. Just take a look at some of their "help" they feature on their website. How can you go wrong with an experienced staff like this? And the last surprise? Considering the serving size of the slices of cake, the prices are downright inexpensive--$4.00 each. You’ll never have such delicious cake—not in Dallas, not in Plano, not even in Soho. Come on down to the used car strip of Garland and be cool with us weird Garland people—but don’t tell too many folks as we don’t want you to crowd the locals out. 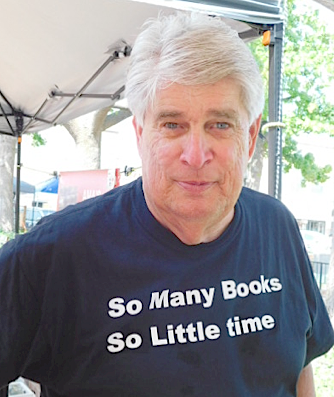 Every day is a day for discovery and learning but this was especially true on Saturday in Garland, Texas. 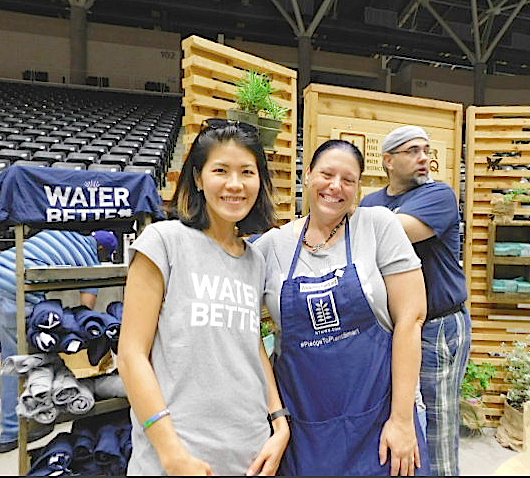 It was the day of the annual Live Well Go Green Health Expo. It was the day of the Chinese Children’s Festival with it’s great legend of the Moon Fairy. 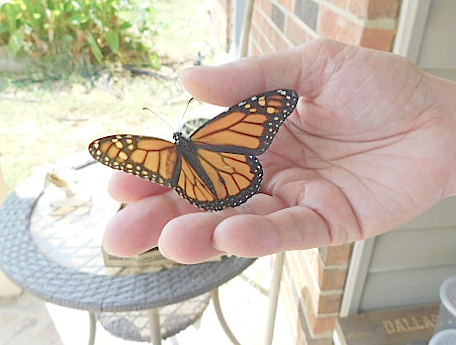 it was the day members of Loving Garland Green tagged and released three Monarchs. It was also the day for the Urban Flea Market on our historic downtown square. The day for Charlie and me ended at 8 PM with the discovery of a wonderful gourmet dessert place right here in Garland. It is located in a repurposed used car sales building. I’ll write more detail about that fun adventure tomorrow. For today I want to tell the long story of our community’s LIVE WELL GO GREEN 2017 EXPO. 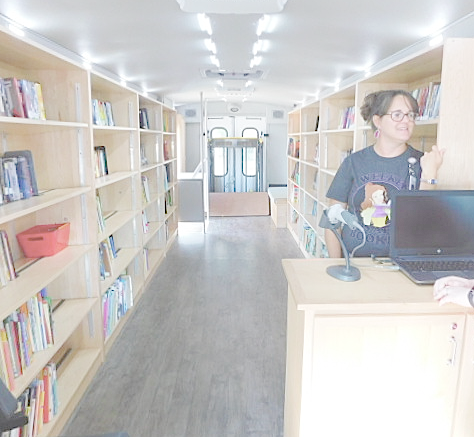 The bus is complete with a librarian to assist visitors in selecting and finding books. 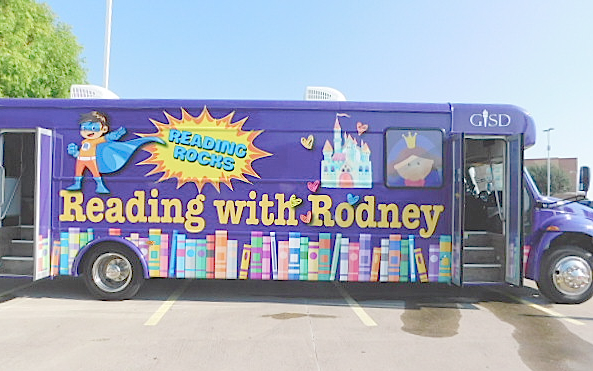 Many of the books in the bus were purchased through a grant. Tell Richelle that Liz sent you. Garland Parks and Recreation Department were well represented. 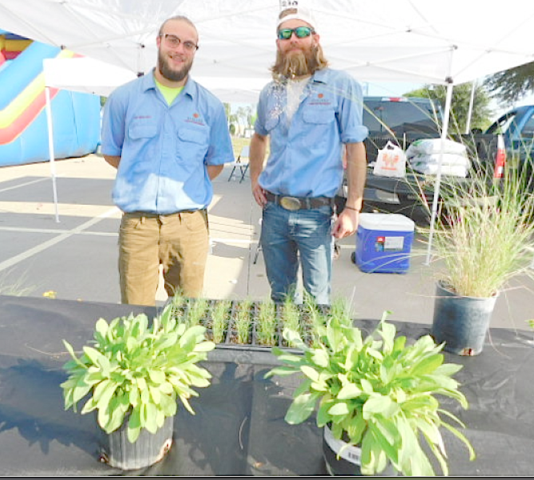 Two fellows from the Garland Parks and Recreation Department standing behind plants they help to grow in greenhouses and then plant to beautify our roadways, Garland parks and downtown area. 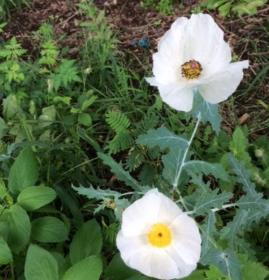 Not everyone knows this, but about 99% of all the beautiful flowers and grasses we see around our City were grown from seed by members of our Garland Parks and Recreation Department. They are a great bunch of folks. I was happy to see them out in full force for this great green event. 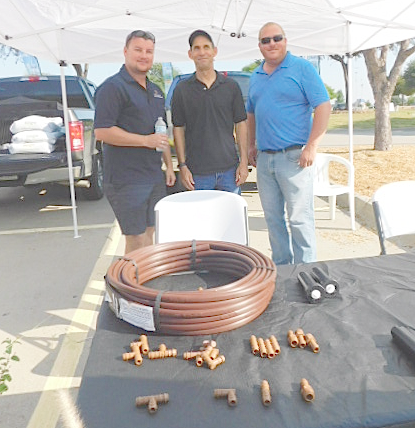 Led by Parks and Recreation Director, Jermel Stevenson, they do more than any group I know of in Garland to keep it green—literally. Not only does our Garland Parks and Recreation staff help to keep Garland Green, they also work hard to ensure that we have fun using all the beautiful spaces they maintain. 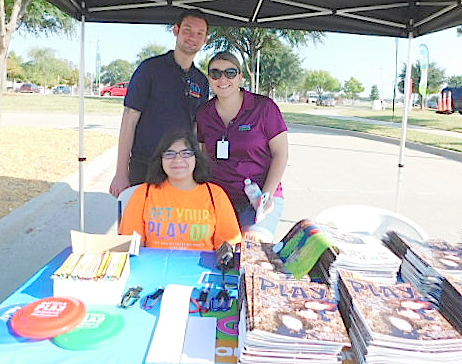 Jackie, featured in the middle of the photo above is the Special Events and Marketing Coordinator for the City of Garland | Parks, Recreation, and Cultural Arts. To help get the word out they publish PLAY, a quarterly magazine with schedules of events in Garland planned for that quarter. In case you don’t know, drip irrigation is the most efficient way to water your plants as it gets the water directly to the plants with almost zero lost to evaporation—thus it saves money and water. I chatted with these fellows as we are almost finished with building grids for drip irrigation at the Garland Community Garden. I asked if they had any issues with it. The only issue they have is that in some places rats will chew through the tubing. They’ve studied the problem, however and discovered the rats chew through where the emitter holes are—thus they are doing this to get a drink of water. I’m hoping we won’t have that issue at the Garland Community Garden due to our proximity to the creek. I can only hope that our rats who live in the nearby woods are not too lazy to amble down to the creek for their water. Inside the Center, I’m sorry to say that I didn’t have time to visit any of the booths on the ground level or the level above that. However I do know that among the many things offered were flu shots and blood pressure readings. On the arena level, I did manage to visit several of those booths but of course, most of my time I spent at the Loving Garland Green booths. Like many of the organizations at these booths, we made a 10-minute presentation at 10 AM, 11 AM and Noon. 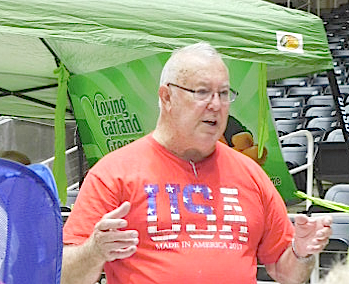 Gene Rodgers of Loving Garland Green led the first presentation on How to Regrow Vegetables. I know, it looks like Gene, a fisherman, is telling one of his fish stories but he is actually talking to a group of folks who came to learn how to get twice as much from the produce you purchase in the store by re-growing some of your vegetables. His presentation was interesting and lively and Gene was very patient in answering all the questions raised by his audience. Like both of our other presentations, visitors who drifted by throughout the morning asked about how to regrow vegetables. Jane Stroud, President of Loving Garland Green, is talking to a group of students about the metamorphosis of the Monarch. To the right is the blue mesh condo in which we had a live Monarch butterfly that eclosed the day before. Jane led the 11AM presentation on the topic of Monarchs and Pollinators. Not only was her presentation well attended, people such as the group of students shown in the photo above drifted by throughout the morning to ask about Monarchs. 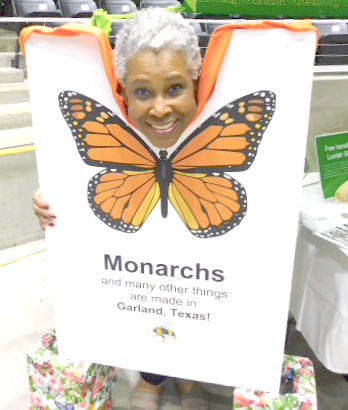 A special thanks to Burgi, a member of Loving Garland Green’s board who brought a live monarch to share with Garland. We also had a Monarch egg, a caterpillar and a pupa to illustrate all four stages of the metamorphosis. At noon I presented on Loofahs—How to grow them, their commercial value, and what to do with them. There is an old expression: “We teach what we need to learn.” It held true for me when preparing for my presentation. People have said to me before that they would not use a loofah because it harbors bacteria after use. I never knew how to answer that. Now I do: “Rinse the loofah under the faucet so it’s wet. Stick the wet loofah in the microwave for 4 minutes and 99% of all the bacteria will be destroyed. “ I prepared a handout that included a study done at the University of Florida to substantiate this. 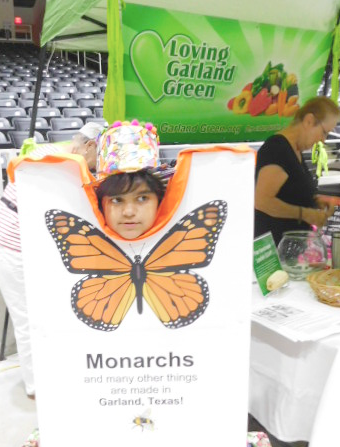 To help support our Mayor and his Mayor’s Monarch Pledge we featured a monarch face sign and encouraged visitors to stop by and have their photo taken as a Monarch and then send a copy to the Mayor and tell him how much they were enjoying the Live Well Go Green Event. Below are a couple of my favorites. I hope he received many photos. This young student was also participating in a recycling contest sponsored by Garland’s Environmental Waste Services Department whereby students were challenged to make clothing to wear out of recyclable items such as paper, plastic, cans, etc. If you visit the LGG Facebook, there is a photo of him and you can see the complete outfit. Visitors to the North Texas Municipal water district had the opportunity to sign up for weekly notices to assist them with watering. Featured in the photo above include my friends Carol Garrison in the middle and Daniel Bell in the back. Sorry I don’t remember the name of the beautiful woman in front who was also one of the stewards of this great booth. 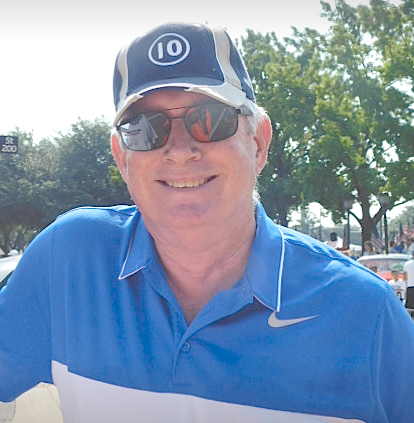 In addition to all the various great City of Garland Departments and nonprofits, this event also featured booths by many of our local businesses. For example, Roach Feed and Seed were there. I stopped by their booth briefly to play with the chickens. As usual they had an interesting display that in addition to the chickens featured goat milk soap for sale. Another local Garland business featured was Dependable Care, a home health care provider. Choosing a local business for just about any service is preferable to me. If things don’t go as I expect, or if I simply have a question, I’m not forced to sometimes spend hours trying to find the right person to talk to. More often than not, there is a direct line to the owner. Dependable care has a gold seal of approval. 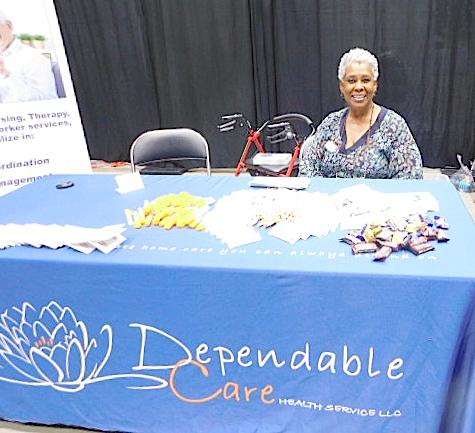 Delores Elder-Jones was one of the representatives at the Dependable Care Home Health Services booth. This is a locally owned Garland Business. We gave away 164 bars of handmade goat milk and shea butter soap and 200 packets of locally sourced seeds from our gardens. 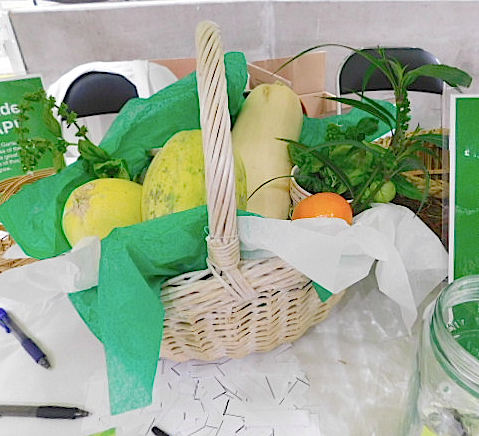 Our day closed outwith the raffle for a lovely basket of fresh Garland garden produce designed and arranged by Margie Rodgers, one of the founding members of Loving Garland Green. The day of living green activities didn’t stop at 1PM when the event was over. 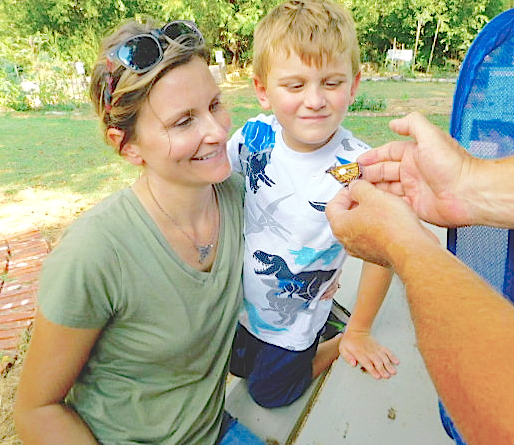 Several members of Loving Garland Green went from the Culwell Center down the road to the Garland Community Garden at 4022 Naaman School Road to tag and release Burgi’s Monarch butterfly. 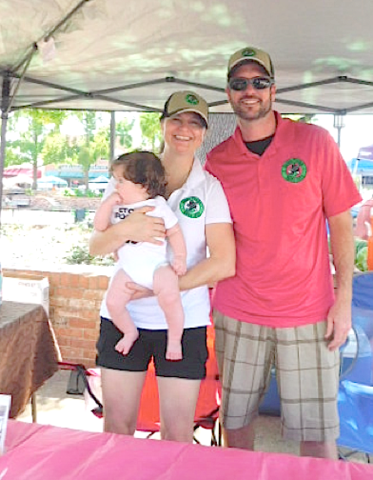 Kim Thiehoff and her son whom we met at the Live Well Go Green event came with us. 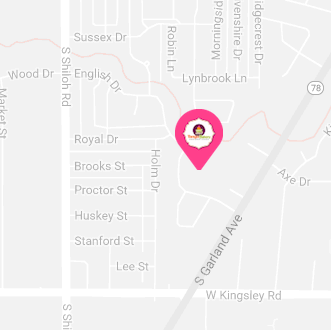 Kim is interested in getting a group of neighbors together to build a neighborhood garden on some City-owned property near the South Garland Branch Library 4845 Broadway Blvd, Garland, TX 75043. If you live in this area and/or would like to be part of this project, call Kim at 469-583-3901. I thought we were done with Monarchs for the day when Jane came home with me to pick up Monarch caterpillars, now pupas, that Charlie and I had been baby sitting for her for the past few days. But, low and behold, two of them had eclosed. We tagged and released these two. As mentioned there was one final event that closed out the perfect day in local Garland, but I’ll write about that adventure tomorrow. The City of Garland is hosting its great annual Live Well Go Green Expo 2017 on tomorrow (Saturday, September 23 from 9 AM to 1PM). This event is sponsored by the City of Garland. It will be held at the Curtis Culwell Center. Loving Garland Green, along with many vendors and other nonprofit organizations, will be participating in this free public event. It’s a great place to come and get the latest information regarding how you can live healthier. There are lots of freebies as well as demonstrations of the latest equipment for growing health food, cooking healthy food, water conservation, etc. Come meet members of Loving Garland Green in person! We will have a booth there. Our features this year include: Monarch Awareness which features a Monarch egg, caterpillar and pupa. In addition, there is information regarding one of our citizen science projects—tagging Monarchs; a Loofah demonstration; and the return of our regrow vegetables that was so popular last year. And of course we have freebies while they last: Handmade loofah soap; seeds; and the opportunity to take a photo of yourself as a monarch. As I’ve mentioned, I’m a member of the Garland Makerspace Discovery Team that is currently exploring potential sites and partnerships to bring forth a MakerSpace here in our City. This is a dream that I’ve been writing to the City Council and the Mayor about since 2015. Other members of our team have also been talking about having a Garland MakerSpace for some time as well. Several members of our team are members of the Dallas MakerSpace and thus they know first hand what great collaborative environments makerspaces can be for incubating new ideas and products and growing local economies. We’ve identified what we believe to be the ideal centrally located to downtown site in Garland for a makerspace. Because the property already has the unused buildings we need on the site, we envision the possibility of putting parts of the Garland MakerSpace in operation within a few weeks of gaining approval and of being able to hold classes early in the spring of 2018. At the moment we are in the throes of preparing our presentation to decision makers for the use of this property. Thus neither approval nor rejection is cast in stone at the moment, but we on the Garland Makerspace Discovery Team have high hopes for our proposal. 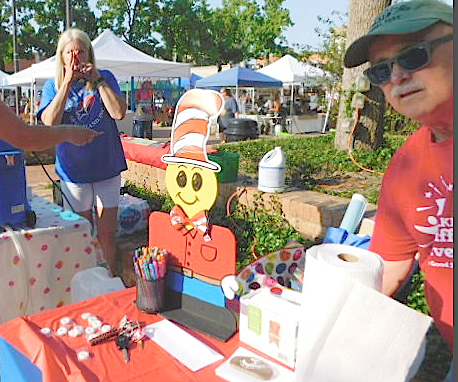 With all this great impending possibility for our community on my mind, I stopped by the Garland Market Place on Saturday to see how my maker friends were doing and to take a straw poll of what they thought about a Garland MakerSpace. With no exception, all the makers were excited about this great possibility. I even engaged one Garland maker who wasn’t even a vendor. People in Garland are excited and hopeful about the possibility of a MakerSpace in our community. Local MarketPlaces and local MakerSpaces go hand-in-hand when it comes to their ability to grow local economies. 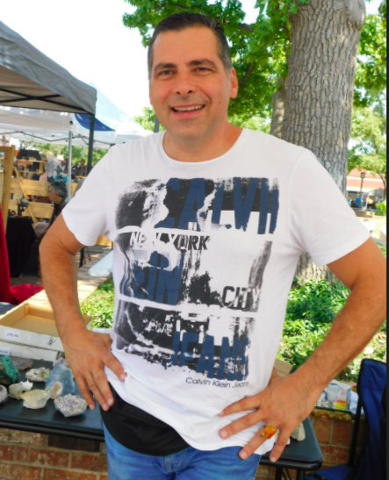 If you’ve been wondering where you might sell some of those cool things you make, call Kirk and reserve your space in the next Garland MarketPlace, which is scheduled for the first Saturday in October. I stopped in at Michael’s booth on Saturday to chat a few minutes. Over the past few years he has been carving wood with the passion of a beaver and the skill of an artist. Until a few years ago Michael had not carved a single twig of wood. But that was before he had cancer and decided to make wood carving his therapy. He began by making small wooden pull toys that he gave away to children in hospitals. Michael became known as the “toy doctor.” From the small wooden toys he graduated to larger pieces—most of which honor our native Americans. When I asked him if he would be interested in teaching a woodcarving class at a Garland MakerSpace, Michael agreed immediately to volunteer. Like other folks I talked with, he was excited at the possibility of makers being gathered under one roof. Not all the makers I chatted with had a booth at the Garland MarketPlace but makers are people who are curious about other makers and what they are doing. In part, it is this innate curiosity that drives their maker spirit. 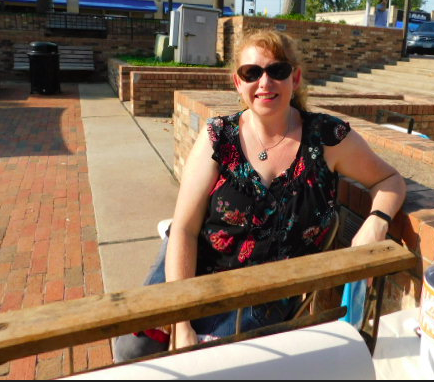 Gwyn has a business venture called “Gwyn’s Pet Art.” She specializes in pet portraits and artwork in pastel, pencil, watercolor, charcoal and colored pencil. Like Michael Burk, Gwyn was excited too with news of a possibly eminent Garland Makerspace. 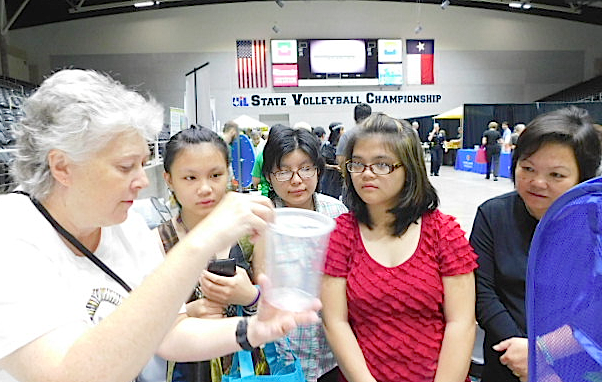 She also expressed an enthusiastic willingness to be part of a Garland MakerSpace and even teach classes there. Steve is a Rockwall Jewelry artist. Steve got to Texas as fast as he could by way of New York. His work is lovely, and like all the other makers, Steve is eager to help us get a makerspace going in Garland. Mother and daughter team of a small family-owned and operated business in Garland, Texas—at the Garland Makerspace- September 16, 2017. Goat milk, one of the main ingredients for their cosmetic products, is known for its wonderful healing properties and it is great for acne, eczema, anti-aging, severe dry skin caused by diabetes or other health related reasons, stubborn dry skin patches, blemishes, also known for causing super soft baby like skin on all who use it. In fact this entire family business began with a search to find a better answer than steroids to treat a family member who has “chicken skin”-- Keratosis pilaris, which creates the appearance of gooseflesh, goose bumps, or chicken skin. Again, these two Garland makers, like those before them, were very excited about the news of a possible makerspace located right here in Garland Texas. For more information about their great products, you can contact either Tara Rodriguez or Marta Ledesma. Damien is a talented artist and I almost was able to obtain a caricature of myself for just a few dollars, but alas, Damien couldn’t take credit card payments. In October I’ll be sure to bring some cash. 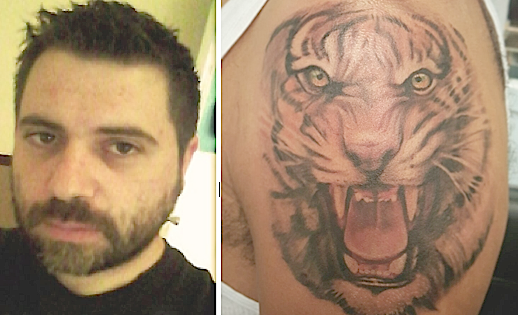 Damien is an illustrator, tattoo designer, creator of motion graphics, graphic design, caricature and portraiture. After retiring, Jeff returned to his real work that he started 40 years ago— ceramics: throwing pots and more. Today, Jeff, a member of the International Ceramic Artists Network, makes pottery all the day-long right here in Garland, Texas. 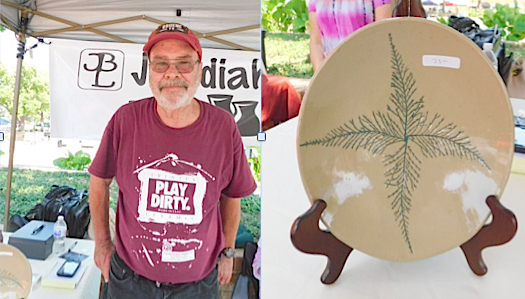 The bowl shown beside Jeff is one of his creations. The leaf impression came straight from nature—a leaf pressed into the clay. We are lucky because Jeff also was excited about the possibility of a MakerSpace in Garland and said that he would be happy to teach some classes. Becky and her husband Ed came to Garland by way of Austin Texas. Both are very intelligent, creative additions to our community. Ed can play the guitar and cook like Julia Childs with a Texas twang. If we are able to obtain the space for the Garland MakerSpace I’m hoping we can, Ed would love nothing better than to teach folks how to make some of his special dishes while Becky would be off somewhere in one of the classrooms teaching Garland residents how to make greeting cards and other artistic creations from paper. 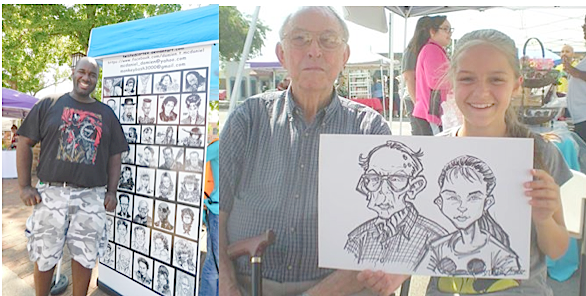 At her booth on Saturday, Becky encouraged people, young and old to try their hand at making a card to take with them. She had more than a few takers. Ed and Becky are personal friends of mine for several years and both of them have told me to be sure and let them know of any assistance they can provide to further the establishment of a Garland MakerSpace. VISIT SOME OF HER INTERNET SITES! 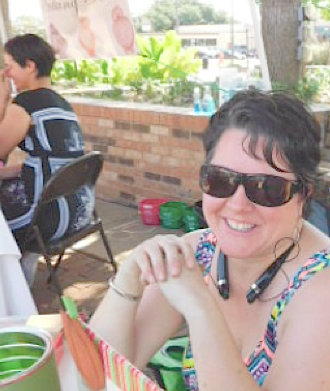 Better yet, meet Becky in person next month at the Garland MarketPlace down at the Garland Square. I must have been momentarily distracted, as I don’t have a photo of Renee, maker/owner of Mobot in my files. You’ll have to go in person on the first Saturday in October and meet her for yourself. If you can’t wait, then all her contact information follows. Mombot Creations was officially founded just a little over a year ago in July of 2016. 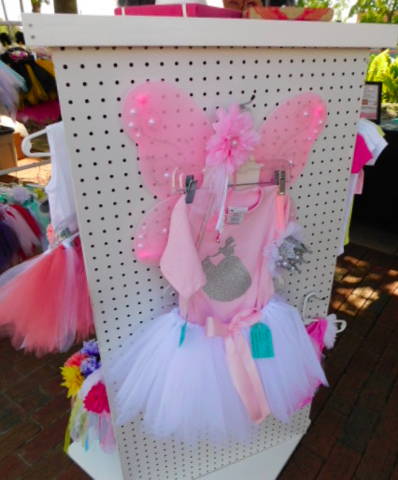 Renee makes tutu sets or dresses for any occasion: baby shower gifts, birthday outfits, flower girl dresses, photo shoots, holidays, etc. 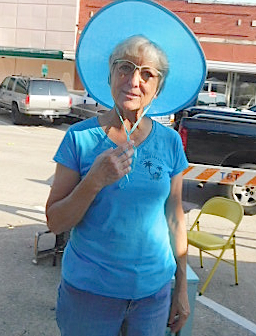 Like all her maker friends at the Garland MarketPlace, Rennee too was excited about the possibility of a Garland MakerSpace. I succumbed twice to the temptations offered by Baking Buns. Because they were next door to my friend Becky with the Wallflower Greetings Booth whom I helped set up, I purchased two cinnamon buns—one for me, and one for Becky. They were delicious. Later in the afternoon I bought two loaves of date bread that I was planning to take to a potluck on Saturday (but ended up taking something else and hoarding the bread for myself). All delicious! And yes, these two young women were also happy to hear that we may soon have a Garland MakerSpace. I stopped by to chat a few moments with Katie and I’m happy to report that her bakery is doing a brisk business. Katie’s creations are very creative and special. For example, last month she featured “Elvis” cupcakes, which of course had bananas and peanut butter as their main ingredients. Saturday’s new offering among all the other great selections was a sugar-free, gluten-free almond and cranberry cake which was delicious. 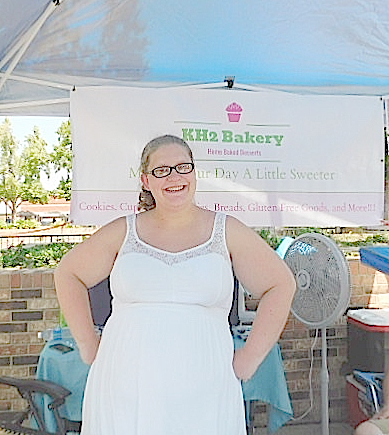 Katie loved the possibility of being in a Garland MakerSpace commercial kitchen teaching others the fine art of baking. Come to the Garland MarketPlace you can not only meet First Prize Winners, you can sample and purchase some of their great wares. 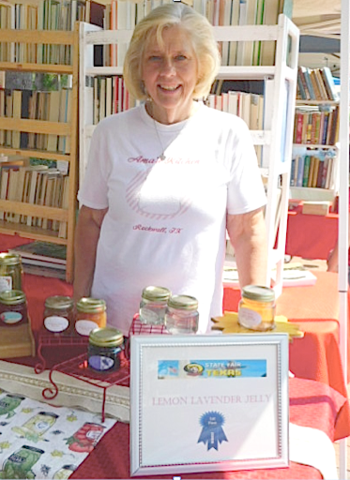 I had stopped by Ama’s booth last month and she told me she was entering her Lemon-Lavender jelly in the stiff competition of the Texas State Fair. I was thrilled to see yesterday that Ama had taken first place at the fair. Naturally she was all sold out of her Lemon-Lavender jelly so I was not able to replace the jar I purchased last month—lesson learned: Get to the Garland MarketPlace early! Bob is among those makers who partner with nature to make their products. He sells local honey that is raw, unfiltered and 100% pure. 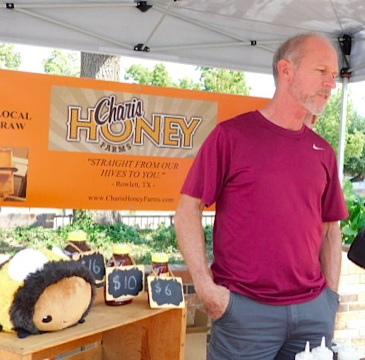 Last month Charlie and I tasted samples of Bob’s honey and the most wonderful of all to us was the Rockwall honey. It is absolutely the best honey I ever remember eating and my father was a beekeeper too so I’ve had many samples over the years. Rockwall honey is in a league by itself. Yes of course we bought a jar of it. That’s another great thing about MakerSpaces: they provide a collaborative place where people and even organizations of local people can come together and combine know-how to make unexpected new things and share their knowledge with others. 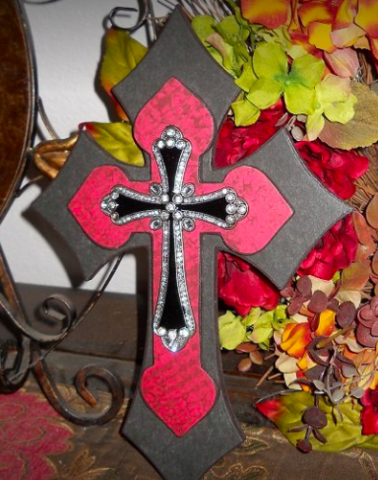 Jimmy Clark has this to say about Drippin’ Rhinestones: “We are a small family business specializing in handmade home decor. Everything you see at our booth or on our Facebook is handmade and cut by us. If you have an idea or want something customized, let us know and we will do our best to fulfill your order. “ Drippin’ Rhinestones is situated in nearby Mesquite. 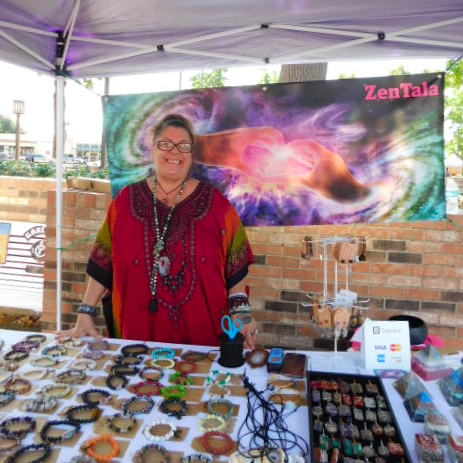 Stacy Smith, who makes beautiful jewelry, was once again at the Garland MarketPlace. I hope we will be able to get Stacey to teach some classes at the local Garland MakerSpace in the near future. Her work is beautiful. I stopped by to chat a few moments with Paul about his current project which is a book documenting all the lost towns of Dallas County. Apparently over the years there have been over 200 towns within Dallas county that are no more. However, if Paul is able to complete his ambition, they will be raised from the dust of obscurity to live once again between the pages of his book. Like most makers, Paul is a fascinating person to chat with. One can learn lot from these folks. For example, last month Paul taught me all about Joe Craddock and the early pickle factory here in Garland that once stood in place of our current downtown post office. 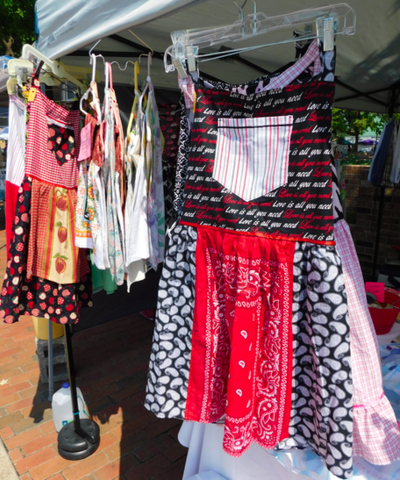 Aprons, Aprons and lots of other interesting items—all handmade by Deanna Ziniga. Deanna, like most makers, is sustainable and self-sufficient. She decided that she didn’t want her kids to have large school loans so she starting sewing aprons to help put them through school. She lives nearby in east Dallas, recently moving to the area from San Antonio. However despite the recent geographical change Deanna’s business had taken off fast—a lot of it due to her clever marketing. Deanna is just one more great addition to a Garland MakerSpace. Once again my friend Becky had a booth next door to this great maker family. Michael has a new flaver of his spicy jelly to offer—Plum Jalapeno Jelly. After sampling it, I had to purchase a jar. It is fantastic, or as Michael, who is overly fond of the double entendre likes to say: “It’s plum delicious.” Michael and Christy are Garland makers. He teaches fifth grade and Christy is a videographer for a Dallas company that offers safari photography tours. Both Christy and Michael promised to assist in any way they can to help make the Garland MakerSpace a reality. The best tamales you’ll ever eat! Later in the afternoon I was hungry and Christy from Bubba Funke Jams and Jellies shared a tamale she had purchased at the MarketPlace. That was it! One taste and I knew I had to go purchase a dozen of them. I ran over to the Tamales Over Texas booth as fast as I could. 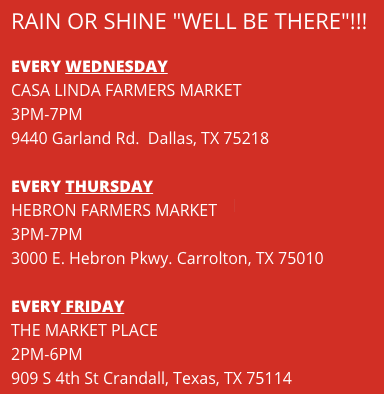 You too can meet the tamales in person at the Garland MarketPlace! 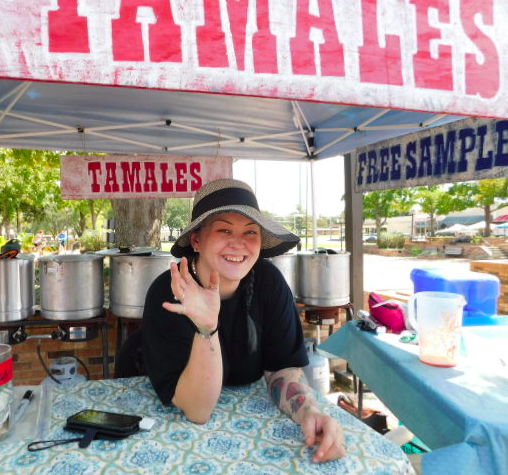 Tamales Over Texas is a gourmet tamale provider as well as provider of unique glazes, sauces, and salsas. They are currently researching shipping so stay tuned in to discover how you can receive tasty tamales without leaving the house! If ever a tamale could be called “healthy” it’s the ones from Tamales Over Texas. 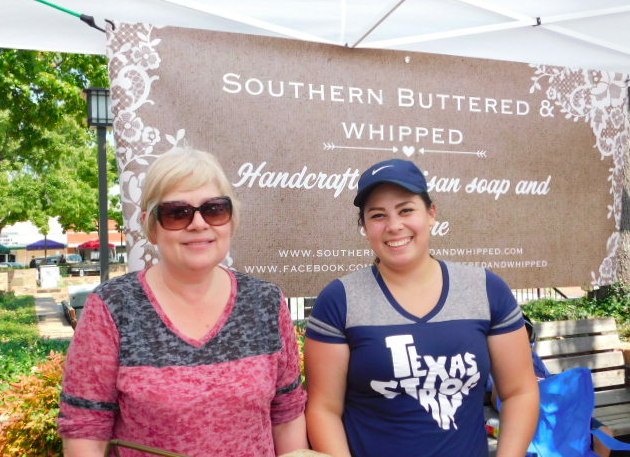 Come meet the makers and repurpose creators in the Garland area! They gather on the downtown square three out of four Saturdays each month. 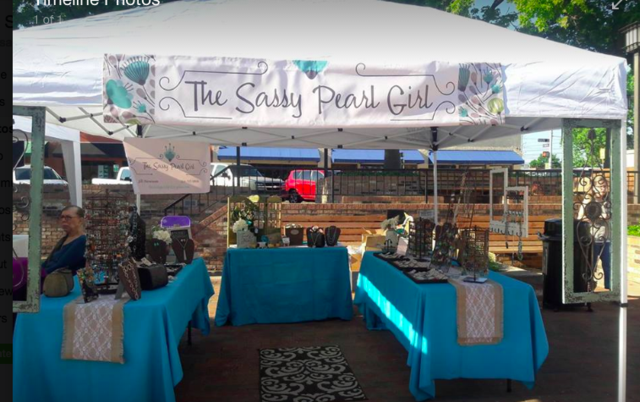 Twice a month on the first and third Saturdays it’s our MarketPlace and then the second Saturday of the month we have our flea market. 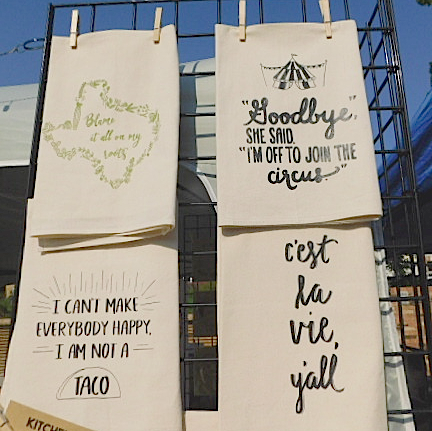 The Garland Urban Flea Market will be featured on the second Saturday in October, November and December yet in 2017. Like our MarketPlace, our Urban Flea Market event also features the live music of local musicians. On Saturday, we had the pleasure of hearing the beautiful voice of Randon Stevenson. Randon bills himself as a guitar tech, vocal coach and one-man band. You can find him online at www.reverbnation.com/randonstevenson and www.facebookcom/randonstevensonmusic . You can find him live by stopping in at the downtown Garland Intrinsic Smokehouse and Brewery. 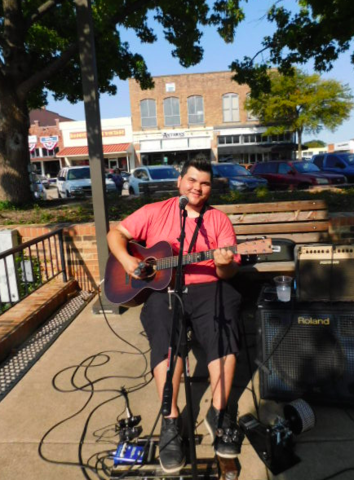 He and Intrinsic are definitely worth the trip to historic downtown Garland. His voice is wonderful. Picker’s Paradise is a local downtown Garland Estates Liquidation Company. They have a huge store on 915 Main Street that is filled with beautiful and interesting items. Charlie and I spent over an hour in their store on Saturday. Unlike many stores selling used goods, their store is clean and as well organized as any Dillards. Visit Trudy’s website at www.reliableestatesserv.com or contact her at Relaibleestatesserv@gmail.com Charlie purchased an antique plate from Trudy when we visited the Picker's Paradise booth. 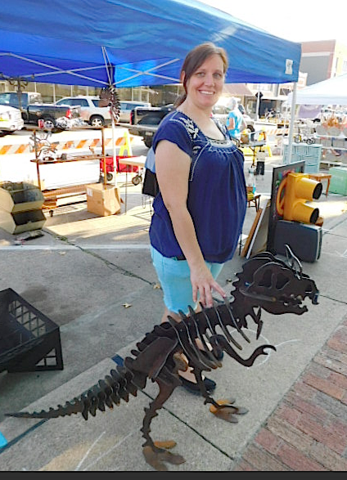 Stephanie Dibble, owner Black Sheep Craftworks located right here in Garland Texas, is highly skilled in metal fabrication, art and more. The work displayed at her booth was both imaginative and well executed. If we are able to launch a Garland Makerspace, we might be able to get Stephanie to share some of her knowledge and skills with people. However, like many experienced and established artisans, she will continue to do her work at her shop. Lucas Cervellini from Rockink Tattoo Studio was at the downtown Garland Flea Market “tattooing” the corner of 6th and State streets with chalk. If you would like more permanent artwork, visit his studio at 316 Main Street in Garland. Jill has lovely selections of her handmade earrings. 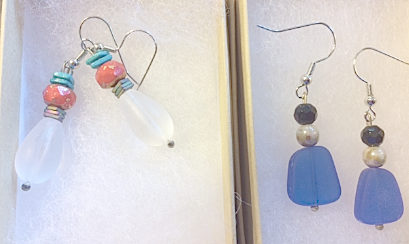 I supported Charlie in his habit of purchasing Christmas gifts all year long and picked out two pairs of unique earrings made from beach glass. Our good pals from the Garland Good Samaritans were there along with their mascot/logo you see sitting on the table. 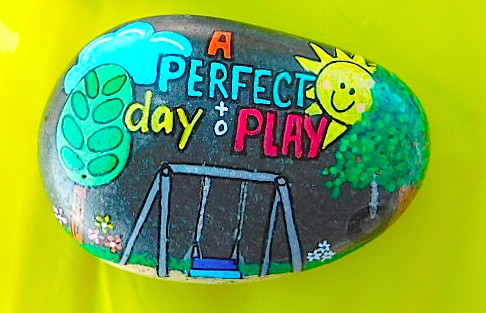 Pam Swendig, director of the Garland Good Samaritans is a rock-painting-artist-maniac. I don’t believe anyone loves paining rocks better than Pam. They had their booth set to encourage visitors to become makers too and paint rocks themselves. In addition, for a suggested donation, you could take a rock already painted home with you. No one can re-purpose boots like a Texan! 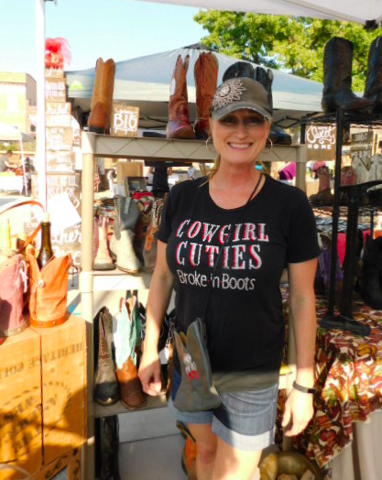 I thought I had seen just about every use to be made from worn-out boots until I stopped by Cowgirl Cuties Broke-in-Boots. India’s messages are not typical. 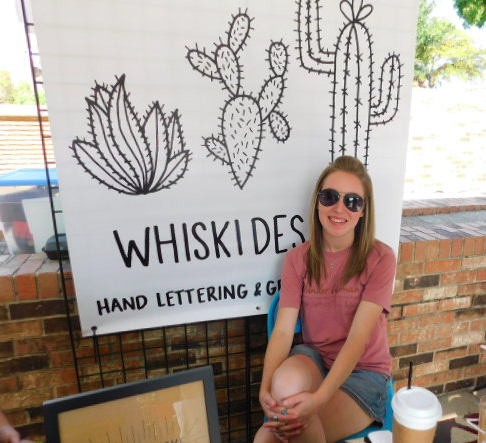 You can visit more of her work at Etsy Shop: WhiskiDesigns; Instagram: @WhiskiDesigns and on Facebook: WhiskiDesigns. 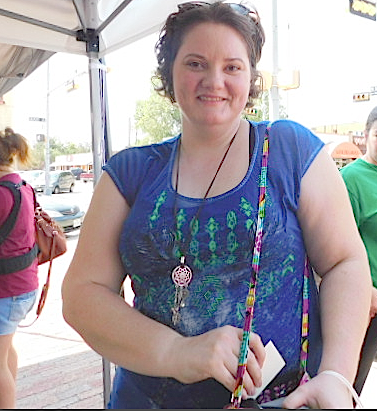 Amanda, like many of the artists at the Urban Flea Market was donating a portion of her profits for the day to the victims of Harvey. Amanda was donating half of all her sales. Purses, purses and more purses! Shanna makes them all. They are colorful and beautiful. Visit her Etsy shop to see what I mean. Arleen Tamburro, Owner (front/right). In the photo on the right we see a necktie that has been re-purposed as a fancy collar. 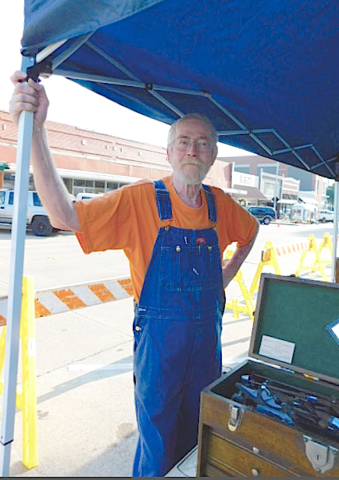 Mr. Dowd is a local Garland resident who has a huge selection of hand tools for the craftsman and collectors. He buys, sells and trades. 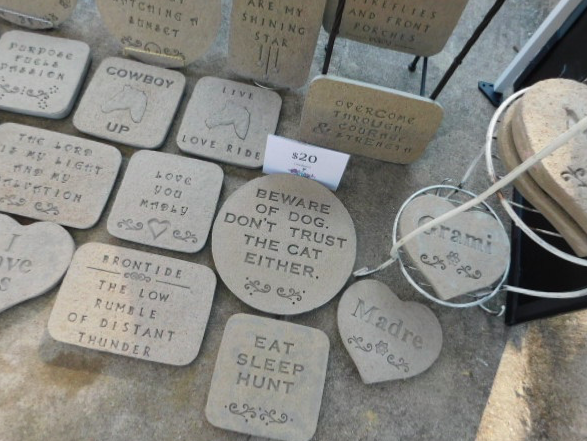 Just a few of Jane’s inscribed concrete stones are shown here. Visit her website for more. The letters are impressed down into the concrete—not printed on top. Great messages and excellent work! I would like to have about 10 different ones for the Garland Community Garden. 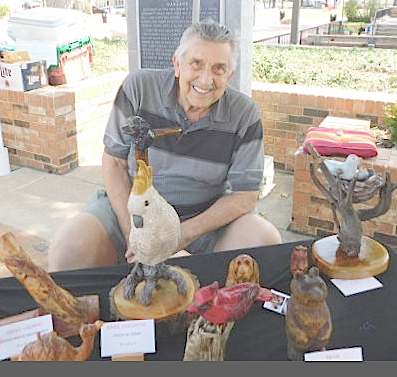 On my next visit to the Garland Urban Flea Market, perhaps I'll be able to provide more detail about some of the other great maker/artisans. 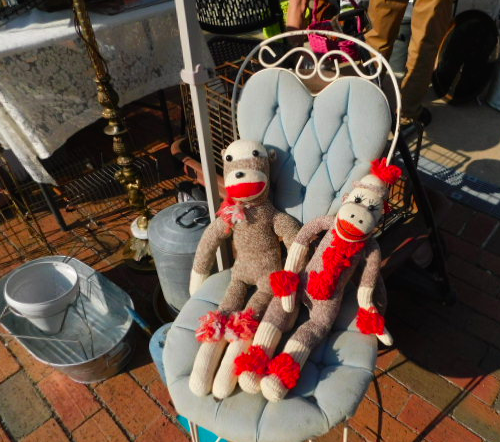 I'll close with these two sock monkeys seen at the Garland Urban Flea Market yesterday as nothing says "re-purposed" quite as well as these two. 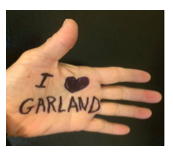 Please remember Loving Garland Green, a local Garland nonprofit. We are the official stewards of the Garland Community Garden and do a lot of work with our local school children. For the past week I’ve really been enjoying the Garland Community Garden. It’s the perfect time of the year. The weather is just cool enough and everything is still green and beautiful. Our heirloom vegetables such as our beans and tomatoes are making a healthy comeback from the heat of summer. It’s the perfect time to bring a book and come sit under the shade of a huge pecan tree in the back by our picnic table—or better yet, just come and sit. During rush hour the dulled sound of traffic from the President George Bush road can be heard. To me, having lived a block away from the Pacific Ocean for almost 20 years, it reminds me of the ocean and I find it peaceful as opposed to distracting. Also the Monarchs are beginning to drift in. Already Charlie has netted and I have tagged and recorded 10 Monarchs—8 females and 2 males. Don’t worry if you see some spots on the picnic table. Once in a while it may be bird droppings but most often these are stains left from half-eat pecans that fall from the branches above. Just brush the shells off and carry on. We have a resident squirrel who loves to eat about one-third of a pecan and then drop the rest on the table down below. Most of them bounce off the table, but not before leaving a stain which does wash off. A couple of nights ago I attended a City Council Work Session. I was there as a member of the Garland Park Board to support Jermel Stevenson, the director, in making a budget presentation to the City Council. I listened as Ziad, a staff member from our Parks Department, told members that a small urban forest in our City would be preserved and not torn down for “progress”. That reminded me of an article I recently read in the summer issue of National Parks. I’ll share it with you here. Perhaps it will inspire one of our local naturalists to become a forest therapy ranger and volunteer for our Parks and Recreation Department. This article I recently read substantiates a topic I’ve presented more than once—the benefits of Biophilia. The biophilia hypothesis suggests that humans possess an innate tendency to seek connections with nature and other forms of life. Edward O. Wilson introduced and popularized the hypothesis in his book, Biophilia (1984). He defines biophilia as "the urge to affiliate with other forms of life". Since the publication of Wilson’s books, there have been many scientific studies conducted that substantiate the measurable physical benefits of being in nature—things such as lowered blood pressure, slower heart rates, and in increase in natural killer cells, and other aspects of improved health. Our parks and green spaces are ever more critical within the ecological system of our urban environment. Shinrin-yoku, which translates as taking in the forest atmosphere or forest bathing, was developed by Japan’s forest agency in 1982 as a way to promote well-being in an overworked population that has one of the world’s highest suicide rates. This practice of soaking up the good vibes through a slow walk or simply sitting quietly in the woods has spread globally. The Association of Nature and Forest Therapy Guides and Programs conducts training in the USA. IN Japan, the government set up dozens of forest bathing trails that people can follow on their own or under the guidance of a forest therapy ranger. Ranger stations allow people to measure their blood pressure before and after their walks. Nicolas Brulliard, associate editor of National Parks magazine, wrote of Melanie Choukas-Bradley who is a naturalist and a certified forest therapist who has led walks in and around Washington D.C. for decades. Brulliard reported that Ms. Bradley’s technique is to structure her walks around a series of invitations. The forest therapy ranger picks up a “talking stick” and passes it around. Everyone is invited to take turns saying on thing they are grateful for. Other invitations include paying attention to motion in the forest. The invitation to pay attention to motion raised up a memory from my past. Many years ago when my sons were young we used to camp in the north woods of Minnesota. We often tented up in the boundary waters near the Canadian border. On one camping trip when trekking through the woods, we happened upon a birch forest and walked deep into the middle of its beautiful hush. I remember the leaves fluttering and making the sunshine flicker and sparkle. It was beautiful and quiet and reverent. We stayed there in awe for almost an hour. Then years later after I moved to Garland Texas via the west coast of California, I discovered that same beauty in the bamboo forest that is part of the riparian area bordering the Garland Community Garden. This area is now closed to the visitors at the Garland Community Garden for a number of good reasons. The riparian area has become a thicket between the garden and the creek. It is home to a plethora of wild life as well as a noise buffer to the President George Bush tollway. Garland has bamboo forest all along our creeks. I would love to see one of them opened up to the public. Being in the quiet of a bamboo forest is, like being in a birch forest, a most unforgettable and lovely experience. 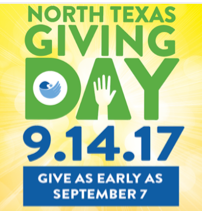 If you want to contribute to a worthy community nonprofit and haven’t decided yet, please consider a donation to Loving Garland Green. We are the official stewards of the Garland Community Garden, participate in numerous Citizen science projects, and host several events and community campaigns for the improvement and education of Garland, Texas. You don't have to wait until September 14th as that day might not be convenient for you. 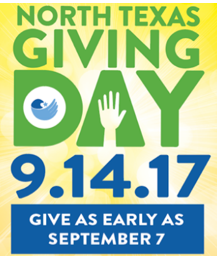 Now you can schedule your gift to Loving Garland Green any time from September 7 to September 13th. Of course if September 14th works for you--that's fine with us.